Oh my gosh, these are good! Those were words from my husband and I every time we split one of these last night. So glad I immediately popped most of them in the refrigerator. That way they aren't in our view to pick up every time we walk in the kitchen. We really do have to give these away today because although they are vegan, they do have lots of sugar. We shouldn't be eating all of these. My friends Christy and Les are moving today. They have lots of help, I am sure, she has at least four children around as well as some cousins to help. I'll drop a dozen over for a nice treat for the hard working crew, her large family. They'll know what to do with them. Our local vegan/vegetarian potluck is next Friday so I thought I'd practice a dessert. There are lots of guests at our potluck who are new to plant based eating and I do like to lure them in with the sweets. I want to let people know that eating a plant based diet doesn't mean just chewing on raw celery, carrots, and broccoli. There are so many fun things to enjoy, but many of us in the U.S. just weren't raised with cakes and cookies made without eggs and milk. I was surprised when I learned to bake vegan six years ago. I had no idea I could get a beautiful, moist fluffy cake without using dairy or eggs. 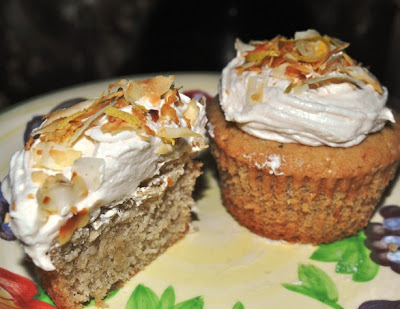 These are a winner and I plan on making them next week: Coconut cake with coconut creme Frosting. The cake is rich and fluffy and the frosting creamy and full of flavor. This cake rose very nicely, a challenge for most vegan cake baking. I've had quite a few cake attempts become 'brownies' or 'bars'. 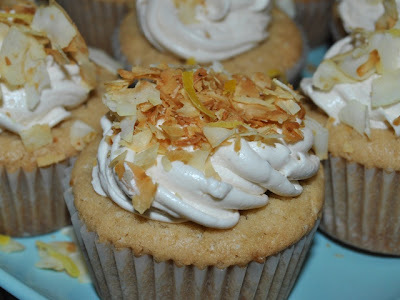 Fresh lemon juice and zest are added to both the batter and the frosting so they have a nice citrus flavor burst. The recipe I used is from a blog post I recently ran across called Vegan Thyme. I bookmarked it immediately. She makes other items, but so far I haven't gotten past her cakes yet, beautiful tasty cakes. It looks like a blog similar to my own. The author says she created her blog to remember. I understand that, so many things I have cooked in the past I'd like to make again, but don't remember all the ingredients because I didn't really measure and I didn't write anything down. 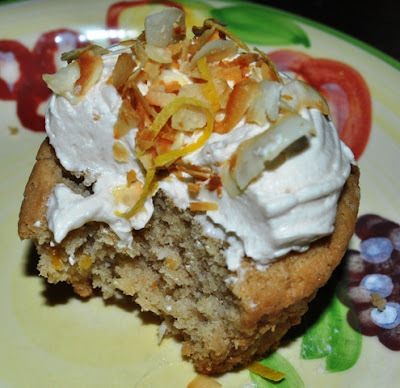 Keeping the blog has helped me record some of the creations I make as well as keep recipes and links I'd like to reference again. I made cupcakes instead of a layer cake. This recipe yielded 24 beautiful cupcakes. 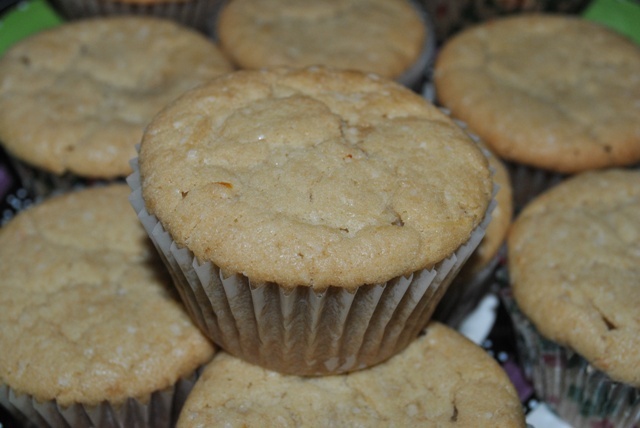 I baked them for about 25 minutes at 350º. I toasted large coconut flakes and added a little lemon zest to the top of the cupcakes. I didn't flatten the batter to make it even in the cupcake pans as the cake recipe suggests. I just used a 3 oz. scoop and let the cake do what it does. As you can see, it turned out just great. Line two 9" cake pans with parchment paper, then spray with non-stick baking spray. In a large mixing bowl (the stand mixer works best)--add the room temperature margarine and sugar and beat on medium speed for about five minutes until the mixture is very light and very fluffy. Prepare the dry ingredients in a separate bowl--the flour, baking powder, baking soda and salt and whisk well to combine. Set aside. Mix together the egg replacer powder with the water. Now, add this to the sugar mixture and beat on medium speed for another two minutes. Add the extracts to this and mix well. Now you add the milk and flour mixture in the following manner: first add a third of the flour and then a third of the milk to the sugar/egg mixture. Mix well after each addition--about fifteen seconds of mixing--then add another third of the flour mixture, another third of the milk and repeat this step until the flour and milk are all used. Remove the beaters from the bowl and fold in the shredded coconut and lemon zest to the batter with a spoon. Don't overmix it! Spread the batter in the cake pans and flatten with a spatula to make sure the batter is even on top. Bake for 45 minutes. The edges of the cake should be golden brown in color and just beginning to pull away from the sides of the pan. 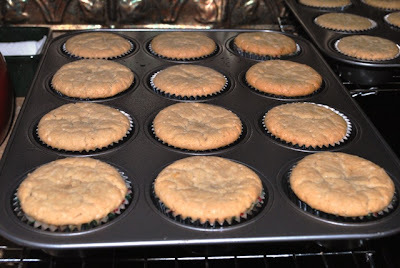 Remove from the oven and allow the cakes to cool in the pans for about 30 minutes. Carefully remove the cakes from the pans and allow to cool completely on cooling racks. Cream together the first three ingredients then begin adding the powdered sugar one half cup at a time. Continue adding the sugar until the desired consistency of your frosting is reached. Add the extracts and lemon and zest. Mix well. If you see that you need more powdered sugar, add only about a quarter cup at a time.